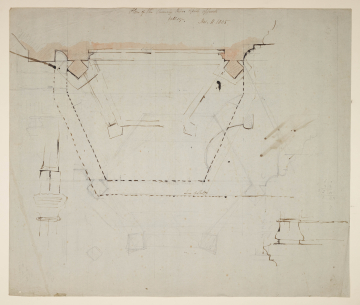 The plan of the hearth was added about four months after the plan and elevation on the recto. The hearth is quite small compared with, say, one of Soane's own (first floor front room of No.14 Lincolns Innn Fields). 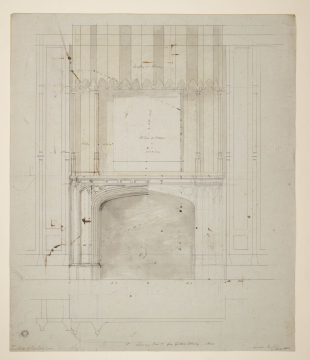 Drawing  shows the executed fireplace. The inscription 'Picture of Mr Astle' refers to Thomas Astle, whose collection of Saxon manuscripts was left to George Grenville, Marquis of Buckingham for the nominal sum of five hundred pounds in 1803. This acquisition then made necessary the construction of the Gothic Library.